A retractable landing gear is probably one of the most popular upgrades amongst drone building enthusiasts, and for good reason too. Not only do they look super cool, they have the big advantage over a fixed undercarriage, in that a retractable gear allows for an unobstructed view of the sky ahead in all directions. If you’re an aerial photographer or FPV flyer, this means you'll no longer get your shot spoiled by the landing skids entering the frame. A retractable gear really comes into its own if you use a 3-axis gimbal. Although you can theoretically yaw a multirotor to achieve a full 360° view without getting the landing gear in shot, you’ll get a much smoother result by using the gimbal itself. A retractable gear also makes a lot of sense if you run a two person operation - drone pilot and cameraman. With the gear retracted, the camera operator will be able to truly ‘fly the camera’ independently of the drone pilot. That is to say without being confined to a narrow field of view set by the heading of the multirotor; controlled by the pilot. All in all, a retractable landing gear makes for a much more versatile setup in regards to shooting video and aerial photography. The wiring couldn’t be easier, simply connect the two retract motors together using the provided Y-Cable and plugin to a spare 5 volt RX channel. You’ll then need to assign a 2-position switch on your RC transmitter. If the switch channel on the TX has fail-safe function, set the fail-safe value so that the landing gear will be in deployed when the receiver enters fail-safe. Fixing screws aren’t provided. We sell a screw package to convert the Tarot frames - sold separately, or another mount option, which can be used to attach the retractable legs to 16mm tubes, as shown in this video. A 16mm-10mm T-piece uprade is available for the landing gear. It's CNC machined from an aluminium alloy, the one that comes in the kit is made of plastic. 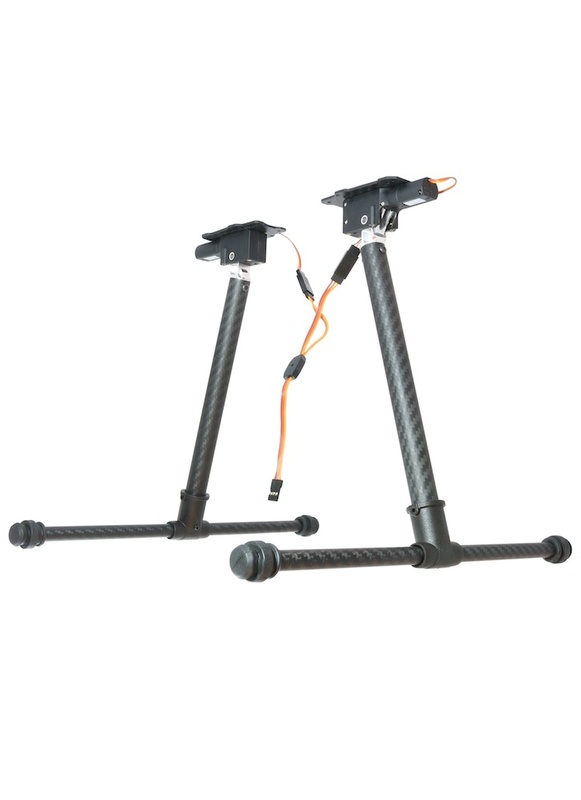 We now sell an alternative landing gear which features all-metal retractors, and a controller with failsafe protection and built in UBEC. Note: Fixing screws aren’t provided. A M2.5 screw package to convert the Tarot frames is sold separately. Hello, I want to know the dimensions of the landing gear. Hi, I've added the main dimensions to the specification. There is also a diagram available to download which shows the dimensions relating to mounting points.